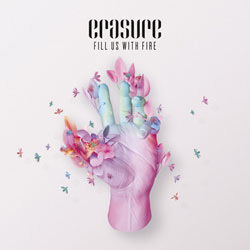 There are three videos associated with the ‘Fill Us With Fire’ single, all made for online use: the ‘kaleidoscope’ video, a montage video, using live and backstage footage from the band’s 2011 summer Total Pop! shows; a rehearsal video recorded in London in July 2011 during preparations for the Tomorrow’s World tour; and an impromptu video made by Andy Bell at the ESO Paranal Observatory in Chile while he was there on holiday! The tracklisting above was used everywhere in the world with the exception of Germany where ‘A Whole Lotta Love Run Riot’ was the lead track. In Germany the album version of ‘A Whole Lotta Love Run Riot’ therefore replaced the single mix of ‘Fill Us With Fire’ as the first track of their digital single. Design: Tom Hingston Studio. Sculptures by Kate MacDowell. Photographed by Dan Kvitka. Produced by Frankmusik, except 2 produced by Vince Clarke. 1 – Mixed by Adrian Hall. 2 – Mixed by Timothy ‘Q’ Wiles at the institute of Gizmology. 3 – Extended mix and additional synths by Gareth Jones. 4 – Remix & additional production by Wayne G & Andy Allder. 5 – Remix & additional production by JMRX. 6 – Remix & additional production by Timothy ‘Q’ Wiles. 7 – Remix & additional production by Liam Keegan. 8 – Remix & additional production by DJ Yiannis.